This Gallery is posted Lovely Photos of Japanese. 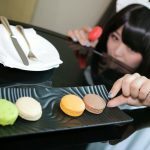 Sena’s “Cosplay (maid costume) Portrait Photos” at Japan. These photos were taken in Tokyo.